Pineapple is very abundant in tropical countries. They contain vitamins and minerals essential to a manâ€™s body to keep him healthy. Starting your own pineapple farm will require more effort and dedication. Pineapple has many by products. It can produce different kinds of products that are very much needed by the people. It can be made into jam, juice, vinegar and other different food types. It can also be made and processed into a high quality cloth. You will never leave a waste if you use pineapple. Its covering and other waste coming from canning may be used as livestock feeds. The soil and climate is essential in starting your pineapple farm. It is known to grow in tropical countries. These pineapples need a mild and relatively same temperature all throughout the year. It even needs an even rainfall for its growing needs. This kind of fruit is grown well if there are enough sources of light and water. It should be in the mild level. Anything that is too much is bad for these pineapples. That’s why it is perfect to grow in an area like those in the tropical countries. Pineapples are ideal to grow in elevated soil particularly in dry soil. The planting materials you will need will be the slips as well as suckers. Slips usually bear fruits within an average time frame of 18-20 months. These should be acquired 6 to 8 weeks after it was harvested. To prepare the soil for planting, one thing you should do is to determine when the perfect time to plant pineapples. There are different perfect times to plant pineapples in different tropical countries. To do slips as well as suckers, you must plant them 8 to 10cm deep in the soil and put 80 to 100cm distance in between these slips and suckers. This way requires a space of 25-30 centimeters in a line, 50 centimeters in a two line and 100 centimeters between two lines rows. This may produce around 44,000-53,000 plants for each hectare. Weeds have always been a major problem in big plantations. There is a way of getting rid of them. Getting rid of them may be by hand pulling or using a hoe. These weeds are used to preserve moisture. You may use herbicide. The diuron is the most commonly used herbicide. It is used at 6.4 kilograms active ingredient for each hectare. Immediately spray after planting. Reuse after two months to prevent the growth of weed. Never use herbicides, which might be poisonous to the crown of the crop. When harvesting, get rid of the leaves from the fruit’s bottom. Put harvesting containers in the last part of the farm rows. Make sure that the containers do not include any rough or sharp projections inside. In addition, those intended for the markets that need fresh fruit must not be loaded in trucks and jeeps without putting them first in the boxes. When harvesting, Smooth Cayenne’s shell colors are normally utilized in identifying the different stages of the maturity of the pineapples. Through this, you will know that you are ready for a good harvest. Since breadfruit trees have the highest yielding fruits, you can have a chance to earn huge income every season. Planting these trees is very fast and simple. Simply follow the doâ€™s and donâ€™ts to achieve positive results. Do you know the ways on how to plant fruit trees? There are useful ideas that you can follow in planting different types of fruit bearing trees and be able to produce harvest good fruits. We are starting a pineapple farm and found this piece very useful and important.One of three fruits variety we want to farm. The farm is known as AP & P Farms and located in Igabi LG,Kaduna, Nigeria. Already processing/packaging outfit has reached advanced stage. AP & P stands for Apple, Pineapple & Pawpaw. We shall be please to receive any other assistance. Thanks for the information on the on pineapple. I am in Tanzania Dar es salaam East Africa.I am planning to invest in pineapple farming could you please advice on the type of irrigation suitable for 50 Hectare farming and how long does it take. it is ready for harvest and any other information that you believe is of importance. Thanks in advance. Tito. i wish to start pineapple plantation in oyo state nigeria pls give me the guide.for beginning of two acres. I intend to start my pineapple farm January, 2012 @ Etung L.G.A, Pls, do keep me posted of all relevant info. Thank you. Experimenting with pineapple farming in Ohuba, Owerri...combining on same acreage with young oil palms. Need advice on timing, optimal plant population, storage and marketing. Thanks. I appreciate your write up on pineapple farming. I intend establishing a 3 hectare pineapple orchard somewhere along Ibadan-Abeokuta road in Oyo State. I would be glad if i can be furnished with relevant information needed for the establishment of such farm. Thank you. your write up on pineapple farming is indeed very elucidating and i sincerely appreciate you. I am desirous of starting a pineapple orchard in Oyo State, S.W. Nigeria in January of 2012 on two acres of land. Pls. furnish me with a list of contact persons involved in the same venture if available and is it possible to plant other crops with pineapple? Thank you and God bless. I have developed much interest in pineapple farming and i intend to start with two acres of land acquired in Badeku village, Ona Ara Local Government Area of Oyo State. I will appreciate whatever assistance you can offer as regards planting materials nursing/handling, harvesting and marketing. Thanks. Pls I want to go into pineapple farming. May I know if pineapple can grow in kauri lag of kaduna state. Thanks. Which species of pineapple is the best to plant. I appreciate your tips. I'm from Imo State, Nigeria. I have one hectare of land in my state and i want to use it for pineapple plantation. What are the requirements and the approximate cost of input including labour. Thank you for your information. I have 11 plots of land in Rivers State in Nigeria and intend starting a pineapple plantation. What are the requirements and the approximate cost of of starting. Tank you for the information provided, I am planning to start my farm of 5 acre in Ogbomosho. what is the requirement and the cost of operation. Kua Investments Ghana is located in Accra, Ghana. Currently we are into maize production but we want to go into pineapple farming(MD2 variety). Please kindly help us with information on the whole pineapple farming business from planting to harvesting of the fruits. Thank you. I am a student at University of Abuja. I want to know if Abuja weather can grow pineapples. I am planning to establish a pineapple plantation. Kindly assist me with necessary information to help me on suckers procurement and other practices. Thank you. I wish to start how can i get the sucker my farm is in ado ekiti,nigeria. I am planning to plant Pineapple in South Sudan Western Equatoria State. Please feed me with right information about the right type and time to plant in my region. I have a large number of bamboo trees on my 4-acre farmland in Egbeda LGA of Oyo state for sale. Need information about potential buyers within SW Nigeria. We are trusting God to start pineapple farm in 2013, but this will be tantamount to professional advice from you soonest. The farm is located in Suntai, village, Bali Lga of Taraba State Nigeria. Where can we get exotic suckers, chemicals for inoculation, etc. Thank you. I am in Tanzania, Geita Region. I am planing to start farming Pineapple here in Geita. Can you please assist me with some more tips on farm preparation, planting, weeding and harvesting. Country -Mauritius. Experience-Long experience in pineapple plantation Needed:5000 pieces of suckers of Cayenne variety as soon as possible. Dear Sergio nicolau, I am Lotun Satyadeo from Mauritius. I can supply fresh pineapples in large quantities as per requirement. I AM FROM NIGERIA, THE RESEARCH WILL BE CARRIED OUT IN FEDERAL UNIVERSITY OF TECHNOLOGY OWERRI,IMO STATE NIGERIA. thanks for the information, I have just stayed my pineapple farm in Ghana n I finds this very educating. i am from tanzania thanks for your information is real helpful but i need more detail about pineapple management such as there is necessity of putting suckers to the nursery before you transplanted them to the field. thanks for this information i am starting to grow pineapple in my small farm, will try if this will be a good additional livelihood for retirees like me. 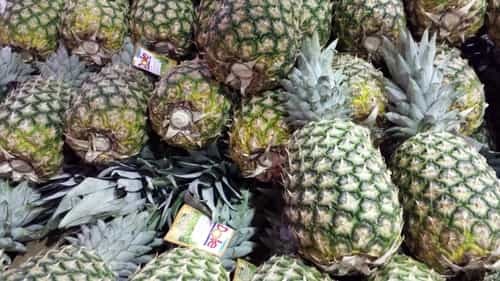 I seek to know the various things i need to invest in when it comes to pineapple farming; for someone planning to manage about 20 arces of land. Thanks so much for your tips, I have just harvested my 2 acre farm, it was a cool deal. Am in Ghana. Now, I need an investor to partner me go into commercial production. Suitable land for cultivation is in abundance. Please can you link me to any interested investor? My email address is prekaussion@yahoo.co.uk, tel. +233509180981. Thanks. Pls I want to start a pineapple plantation on a plot of land. I'm in IMO state Nigeria... thanks for your advice and info. I would want to know how many stands that a plot of land can accommodate. Sir, I intend grow pineapple orchard in large quantity and I have 300 acres of land near lagoon. Can it be used for the purpose? farming process i mean. Sorry for the error in spelling farming. Thank you. I am a Ghanaian working in the public sector of Ghana. I started a commercial pineapple farm recently in the central region of Ghana. I found your piece very useful and will be happy if further guidance can be offered me to help me apply the best farming methods in the farming process. Hi I am looking for procuring pineapples in large quantities from east Africa, please contact me if you have.